What trends do you think will shape the future of UK plastics? How will Sprint Tool & Die respond? Metal Additive Manufacturing hybrid machines will change the way we look at producing tools. They are able to produce cores and cavities quicker and with the added benefit of conformal cooling which will reduce cycle times. These machines are prohibitively expensive at the moment. We are starting to contract out the process and one day I expect them to be in every quality toolmaking shop. How has Sprint Tool & Die developed during your tenure? What do you credit as the key to your success? The toolmaking industry had a poor reputation for late delivery of projects. I set Sprint to produce quality products to agreed delivery dates. We never give a date that we do not believe can be achieved. We have had an on-line progress management system for 15 years so customers can monitor the progress of their tools. What has been the greatest challenge in your career? Finding talented personnel to enable us to grow as energetically as I would have liked. What advice do you wish you’d had on entering the industry and does that differ from the advice you would give to an apprentice joining now? I was fortunate that I had a good traditional toolmaking apprenticeship and I was advised that to be a good toolmaker you need “speed and accuracy – one is no good without the other!” I pass this on to our apprentices today. I am good at thinking outside the box in the approach to tool design. 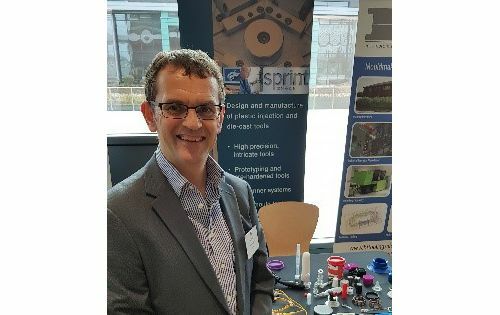 Sprint has won many tooling projects over the years that have been turned down by other toolmakers, as well as several toolmaking awards recognising our approach. I’m also not afraid to take risks. No-one knows the limits of their abilities unless they push the boundaries. This philosophy I have applied to business and is my general approach to life.